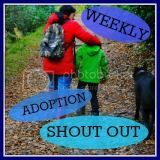 Last week we had some great new blogs join us on the Weekly Adoption Shout Out, so a big welcome if it was your first time and we hope you are joining in again. We also saw some wonderful posts by those who are fast becoming the WASO veterans; I’m sure you know who you are and thank you, keep up the good work. This week we have chosen the theme of “contact” a subject that many adopters have to deal with, whether it is letterbox or direct contact with birth family. We are really looking forward to reading your contributions on this topic. This theme as always is optional, so if your post is not related that is fine, please still link up. I know this is a bit off-topic, but I've read quite a few of Amanda Boorman's blogs (All Aboard the Trauma Train) through WASO and found them really powerful. Unfortunately, I can't seem to post comments on the blog as I can't work out how to remain anonymous and I daren't risk linking my real name with my blog. If you see this, Amanda - thanks for your blog!